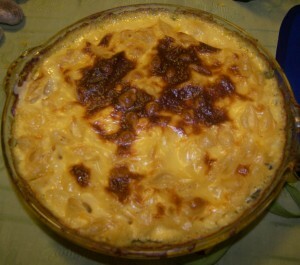 Lately, I have have experimenting with using different types of cheese to make my classic baked macaroni & cheese. I found some New York Sharp Cheddar cheese on sale for $3.99 a pound at Joe’s Produce in Livonia, Michigan last week, so I grabbed about a half pound chunk (or 8 oz). New York Sharp Cheddar is a really sharp cheese that was one of the first cheeses made in the United States, naturally in New York. It is typically softer than other cheddars. For this mac & cheese recipe I used shells which was the only pasta I had on hand, but you could easily use the traditional elbows, penne or ziti, or whatever your heart desires. Now to make the cheese sauce. In a large saucepan, melt the butter over low heat. When the butter is completely melted whisk in the flour, black pepper, mustard powder, and a pinch of kosher salt. When the flour is fully incorporated, pour in the milk. Turn your burner to medium, stir often, until the mixture comes to a boil. Let the mixture boil for 1 minute, stirring constantly. Now slowly pour in the shredded new york cheddar cheese and whisk to combine. Pour the sauce over the pasta, mix to combine. Now place the entire thing into your oven and bake for 25 minutes. Remove from the oven, let cool for at least 5 minutes and enjoy!